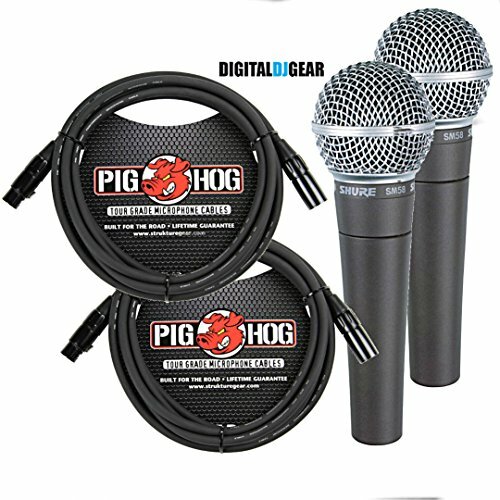 This listing is for 2 mics and 2 10' Cables. A standard on stages throughout the world for years, the Shure SM58 Dynamic Vocal Microphone offers a carefully tailored frequency rise at about 4,000 Hz for smooth as silk vocals that stand out in the mix. Long associated with its unmistakable sound and unsurpassed reliability, the Shure SM58 Dynamic Vocal Microphone is widely considered the most popular mic in the world. Designed for professional vocal use in sound reinforcement and studio recording, the Shure SM58 Dynamic Vocal Microphone utilizes a highly effective, built-in, spherical filter that minimizes wind and breath pop noise while the cardioid pickup pattern isolates the main sound source and minimizes unwanted background noise. The tailored vocal response on the SM58 is a legendary tone that has become a world standard. Shure SM58 Dynamic Vocal Microphone Features: Smooth, mid-frequency presence rise for world-famous SM58 Mic sound, Uniform cardioid pickup pattern isolates the main sound source, Minimizes background noise, Pneumatic shock-mount system cuts down handling noise, Rugged construction for extreme reliability in demanding applications, Effective, built-in spherical wind and pop filter, 50 to 15,000 Hz frequency response, Supplied with break-resistant stand adapter which rotates 180 degrees, Legendary Shure quality, ruggedness, and reliability, Includes a mic stand adapter and a zippered storage pouch, Proximity Effect: When the sound source is less than 1/4 inch from the microphone, the microphone boosts bass frequencies (by 6 to 10 dB at 100 Hz), creating a warmer and richer bass sound than when farther away. This effect, known as proximity effect, happens only in unidirectional dynamic microphones like the Shure SM58 Vocal Mic. The low-frequency roll-off on the SM58 provides greater control, allowing the user to take full advantage of proximity effect.